Prepare yourselves, football fans. The world is about to become a very different place. You see, Super Bowl Sunday is upon us and there’s a lot on the line, perhaps even more than in Super Bowls past. Sure, the Atlanta Falcons winning their first ever Super Bowl last year would have been a nice story. And the Seahawks winning their first a few years ago was also good for the town and the league. But Super Bowl LII (that’s 52 in Roman years) will be altogether different. Either the juggernaut known as the New England Patriots will win their sixth in sixteen years or the Philadelphia Eagles will win their first. As an innocent bystander, I’m not sure which outcome will be worse… but rest assured, both will be bad. Very, very bad. I know a ton of Eagles fans. They are as diehard as they come. They’ve been thirsting for this moment ever since their parents first dressed them in green and spoon fed them kielbasa in the crib. 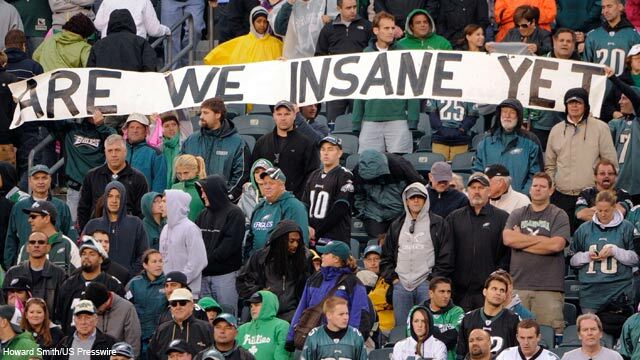 If they somehow manage to fend off the Pats, I’m here to tell you, we will have a whole new unbearable fan base on our hands, drunken Eagles fans with a side of violence, running rampant and looting the nation, making it a half a block before they realize they’re too out of shape to do any further damage to anything but their livers, finally wiping the tears from their eyes as they shout “Fly Eagles Fly!” Or what I like to call Purge: Eagles Super Bowl Victory. They’ll step up the obnoxious for the rest of their lives, even more so than they already do, by telling you in vivid detail of the night they beat Tom Brady. You know, kind of like Giants fans do. On the other hand, there are the chowder heads, the uber-entitled lot who once rooted for a franchise that was irrelevant until the afternoon Drew Bledsoe got hurt. Much to the adulation of Patriots fans everywhere, the guy who took that very next snap sent Bledsoe into Wally Pipp obscurity, setting a new standard for quarterbacks, appearing in eight Super Bowls, which is mind-blowingly impressive when you consider most players have never been to one. 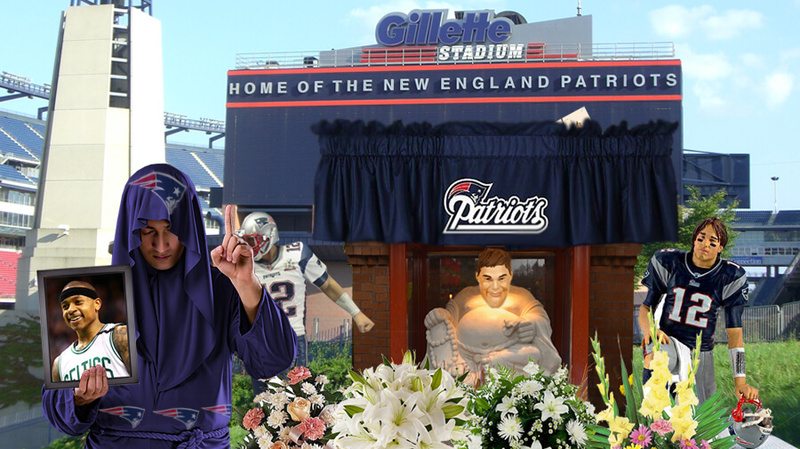 Trust me when I tell you there is more than one shrine fully alit and dedicated to Tom Brady on this very Sunday. Maybe I’m just jealous. As a general rule of thumb, Buccaneers fans are so disinterested in their team, they’re barely aware a game is going on, too busy bitching about paying thirteen dollars for a Bud Light and reminded of the infrequency with which they actually score touchdowns only when a grounded pirate ship explodes fake gunpowder into the air. We’d gladly switch places with either of these two fans bases if it weren’t for the cold weather and rap sheet. So pick your poison, folks. Either way, come Monday morning, we’ll be living in an all new America. It’s unfortunate either team has to win. Happy Super Bowl Sunday, everyone. This entry was posted in Featured, Life of Sports Chump, Pigskin and tagged Atlanta Falcons, Drew Bledsoe, New England Patriots, Philadelphia Eagles, Seattle Seahawks, Super Bowl, Tom Brady by Chris Humpherys. Bookmark the permalink. I’ll have you know that despite being your age, this Eagles fan can still bench 300 pounds and lift my body weight over my head. On top of that, most of my liver isn’t in a specimen jar. So can my maintenance girl. Great game when all said and done. Defensively the two teams left a great deal to be desired. Kudos to the Eagles and their fans !!!!! I finally realized that my subculture lifestyle can watch and stay interested in a ballgame without any monetary risk. I feel good this Monday morning. I wonder how Jesse James and Tomlin feel? Goodell and his 31 owners have 6 months to figure out how to speed up the game and continue to have subjective replays. I know plenty of Eagles fans that are walking to work today with their heads held high… and probably a little hung over too. I had some action on the game but not much. Didn’t have a great feel for the outcome although I was leaning Pats. You’re right about the catch, Jesse James and the NFL off-season. I’ll have my thoughts up on that eventually, some conclusions about the NFL season. But yea, this is something they’ll need to address for certain. Ain’t nothing wrong with that as they thoroughly deserved the win. The Patriots became reckless and complacent. I’d certainly like to know Bill Belichick’s reason for not playing Malcolm Butler. Disciplinary reasons my @ss . I see that Isiah Thomas experiment didn’t last long in Cleveland ? Now he’s going to be playing alongside Lonzo Ball as part of the Los Angeles Lakers’ backcourt ? That ought to be a great deal of fun. I wonder what Papa Ball will have to say about that ? E-A-G-L-E-S…Eagles. Sports talk radio in Philly will never be the same…at least until next week when the quarterback “controversy” will begin! People are already throwing out wild trade scenarios in an effort to repeat. Free agency will be here soon enough…and it will be interesting to see which players Philly looks at as necessary pieces…and which ones might be offered for desired pieces. Sorry to see two offensive coaches depart but Doug is going to call the plays anyway. The Malcom Butler story was weird and I’m sure we haven’t heard the end of it. Very un-Patriot-like. Wish I had known of his benching before I bet New England. And yeah, Cleveland did well with that trade. Wonder what’ll happen to Isiaiah. Not sure I see him playing with a legit contender in the immediate future. The reigning Super Bowl MVP is under contract for seven mil next year? Probably more than Wentz is making, yes? I imagine they’ll keep Mr. Foles for as long as they can… and by that I mean until they get an offer they can’t refuse from the highest bidder.